The Burton Bulb is a neo-vintage LED bulb that emulates vintage Edison incandescent bulbs while solving the quality issues from the first generation of LED bulbs. The Burton Bulb offers flickerless LED technology which avoids stroboscopic effect and True Color Dimming capabilities. The lightbulb contains 100 light emitting diode flip-chips on a 130mm ﬂexible substrate that can be bent to mimic various styles of incandescent ﬁlaments (Spiral, cone, helix etc.). These LED’s are phosphorous doped to increase the color rendering index value to 95, reducing “green spike.” The phosphorous is slightly frosted to eliminate the harsh, sharp light given off by a LED. All electrical components that convert alternate current to direct current have been designed to ﬁt into a base that assembles easily with the outer glass envelope. The 3Watt lamp produces a 25 Watt equivalent, at 2200K. 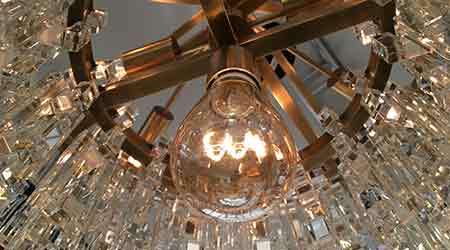 The ﬁlament and glass bulb is shaped and tinted into vintage Edison style fashions.